Hyundai is calling it the perfect SUV, and yes of course that is a bit of a stretch! But is there some truth to it? The only way to really figure that out is to put it to the test against the segment benchmark - the Renault Duster. The Hyundai Creta is based on the same platform as the new i20 and what works for the car is its well-designed proportions and good looks. It has been launched with two diesel engines and one petrol. The 1.6 diesel also has an automatic variant, and there's no 4-wheel drive. Pricing is premium at between ₹ 8.59 and 11.19 lakh for the petrol, and ₹ 9.46 and 13.47 lakh for the diesel variants. The Duster has always been a bit weird looking, in a good way. The quirky looks give it a very definite identity, and there's no doubt Indian buyers have taken to it. The Creta is the beauty pageant winner though. But the weird thing, which I just can't seem to figure out, is why Hyundai has used LED lights up front in the form of parking lights rather than daytime running lights. The styling is Hyundai's fluidic sculpture 2.0 design language, which is accentuated by the headlamps, front grille, rising waistline and the taillights. That is weird because it's happening at a time when internationally most carmakers (including Hyundai too) are obsessed with daytime running lights - across segments. That's like what Mahindra has done with the XUV 5OO and the new Scorpio. A big miss in my opinion! The Duster has no such embellishments and looks chunkier and wider - because it is bigger anyway. The Duster also has the USP of an all-wheel-drive, which is mated to the 108 bhp 1.5 litre dCi engine. The car only has a 5 or 6 speed manual gearbox though. Renault is working on a possible auto option later this year. The Creta has no 4X4 but does have automatic. Despite the obvious differences then, we are comparing models really not just one variant of each car. And so the first thing I wanted to do was get both cars out on the road. Both cars come across as well engineered, and modern. The Creta has a terrific suspension, which handles all that you can throw at it (within reason!). The Duster though has also proved to be tough in this department, but the Creta does it with aplomb. Its handling is also nice and taut, but there is a little bit of body roll that creeps in at high speeds - primarily when cornering. Only the top-end Creta has ESC or electronic stability control; and on the Duster too it's only standard on the All Wheel Drive variants. The Creta is hit by the lack of a precise steering, which has no feedback and has too much play in it. The Duster though has no such troubles, for a car of this size. The Duster may not have the ride quality of the Creta but certainly handles better. It's a lot surer of itself and gives you tremendously satisfying drive feel overall. The Creta is a quieter car with better NVH levels. NVH? Noise Vibration and Harshness! The suspension setup on that car is a lot more comfort oriented car, it absorbs potholes a lot better too and so if you want that typical belligerent SUV feel - the Creta isn't for you. It drives like a car. Period. So the Creta lacks a good steering but wins on ride quality. What about performance? The Creta's 1.6l engine itself is reasonably peppy and powerful and more so on the manual. But not all that exciting on the auto. The engine is tuned for city driving, and ambles well in bad traffic. But as you push the pedal down the turbo lag really disappoints, taking it's own sweet time to kick in and when it does kick in it's a loud growl - almost as if the engine is complaining to have been woken up from its slumber. The Creta automatic is a tiptronic gearbox and also has the 'H mode' for manual shifts. But things don't change much in terms of better power delivery. The manual gearbox is a lot more responsive, and even the engine tuning to the manual makes the drive much more fun than on the auto. The Duster has two iterations of the diesel engine and I've got the more powerful one, as that's the one with the AWD option. The 1.5 litre dCi engine on the Duster is clearly the more fun engine to drive, though I've always maintained the 85 PS is also a fun car - and you're not compelled to buy the 110PS for that aspect. There is minimal turbo lag, and the gearbox has been well mated to the engine too. The AWD gives you a surer ride, but again I do think the 2WD does quite well too. The Duster diesel does get a little noisy inside the cabin. So the NVH level aren't as impressive as the Creta's. Hyundai hasn't let us have a stab at the 1.4 CRDi Creta so I can't really tell you how that compares to the 85 PS Duster, but going by the like engines we know from the Verna, the Duster is likely to stay ahead here too - but I cannot say that with complete surety, you understand! The advantage of the Creta also lies in its cabin layout and fit, but it lacks the roominess of the Duster. It's a well laid out dash, also finished well, with comfortable seats. The driver's seat is height adjustable. All the connectivity options that you expect these days, along with steering mounted controls, a good trip computer and there a big touch screen with navigation are standard on the high end variants. So really everything you think of including the reverse camera is there. The sense of space isn't as obvious as the Duster's, especially at the rear where the high windowsill limits the airy feel too. A lighter colour palette might have helped to make the cabin appear more airy too, which isn't the case. Duster has a more basic yet functional layout. It's also well finished but that's about it. Even though feature wise the two cars aren't too dissimilar (the Duster also has touchscreen navigation), the Duster doesn't come across as premium by comparison. It is a very comfortable cabin, with a great sense of space, and is very roomy. The upright and tall seats also give you a commanding view of the road, with a more SUV-like feel then. And then comes the aspect of prices. Variant for variant the Creta is priced marginally higher than the Duster. Hyundai could've done what it usually does and undercut the rivals - by pricing aggressively and compelling competition to react. By going higher, Hyundai may also have done this because its constrained production capacity may not feel as much pressure, as it otherwise would have. Though it still claims 18,000 bookings for the Creta - so good luck with waiting periods! So what's the bottom-line, you ask? The Duster stays the segment benchmark and takes this faceoff. 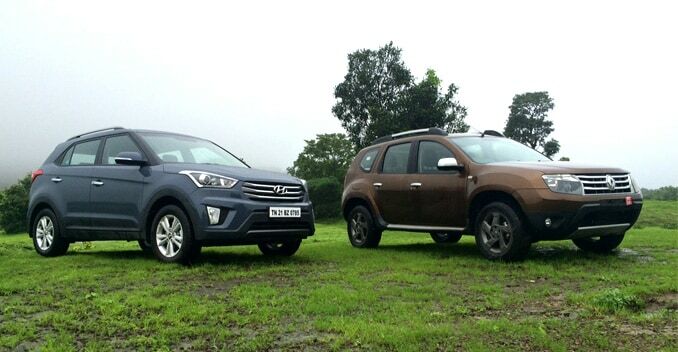 Not by a huge margin of course - and on many aspects the Creta is ahead. For many buyers the Creta will still be more appealing, and rightly so. But in this competition I am choosing the car that better represents this segment in terms of performance, attribute - and very importantly aspiration. And therefore for me, albeit with a slim margin, the Duster is the winner.